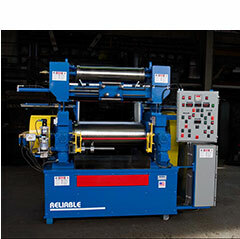 RELIABLE'S experience and capabilities in the engineering and manufacturing of Two Roll laboratory mills is unparalleled. Our forte is providing cost-effective solutions to match your exact machinery needs & process requirements. Our capabilities in mills are the broadest in the industry, from 3” x 8” up to 14" x 40" cabinet mills.” These solutions include new, remanufactured and rebuilt-guaranteed laboratory rubber mills. Available features include: an automated control / data acquisition package, variable speed drive systems, overhead mill blenders, hydraulic batch plows, motorized roll nip adjustments, anti-friction/roller bearings, drilled rolls and hydraulic drives to name a few. Should your requirements be geared towards a traditional, cabinet style, laboratory mill, RELIABLE offers a wide selection of cost effective solutions. These industry proven laboratory mills, whether new or rebuilt are used in conjunction with oil, water or steam Temperature Control Units (TCU's) for heating and/or cooling of the mill rolls. Available features include: an automated control / data acquisition package, variable speed drive systems, variable roll surface friction, motorized roll nip adjustments, flip-up stock guides, energy efficient motors, roller bearings and chrome plated rolls, to name a few. At RELIABLE, we engineer each mill to your exact requirements. 6" x 6" x 12"/13"